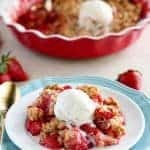 Easy Strawberry Crisp – Sweet and juicy strawberries topped with a buttery brown sugar oat crumble. This delicious fruit crisp comes together in minutes and it is sure to be a crowd pleaser. Step by step VIDEO BELOW! You know it is berry season when nearly every recipe I post has berries in it (margaritas, lemonade, jam…I just can’t stop). 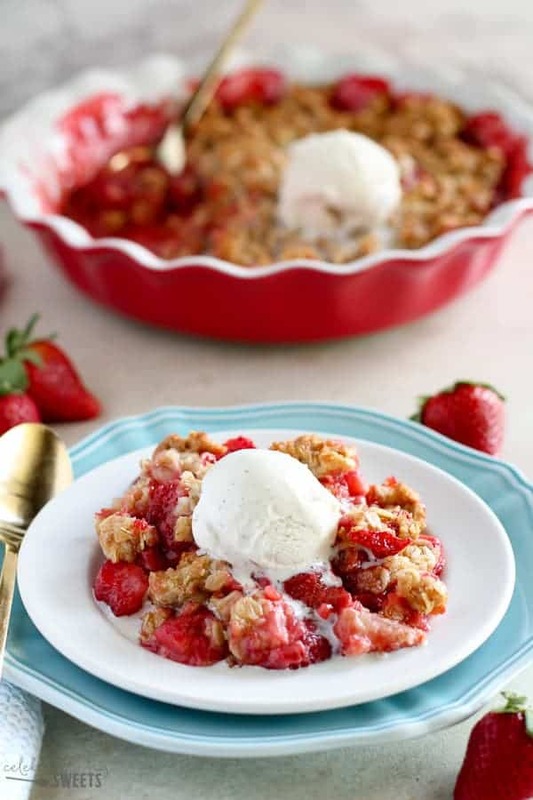 Today I am bringing you one of my absolute favorite desserts of all time: Strawberry Crisp! This time of year I find myself over-buying strawberries. They are beautiful, well priced, and they scream “eat me”! 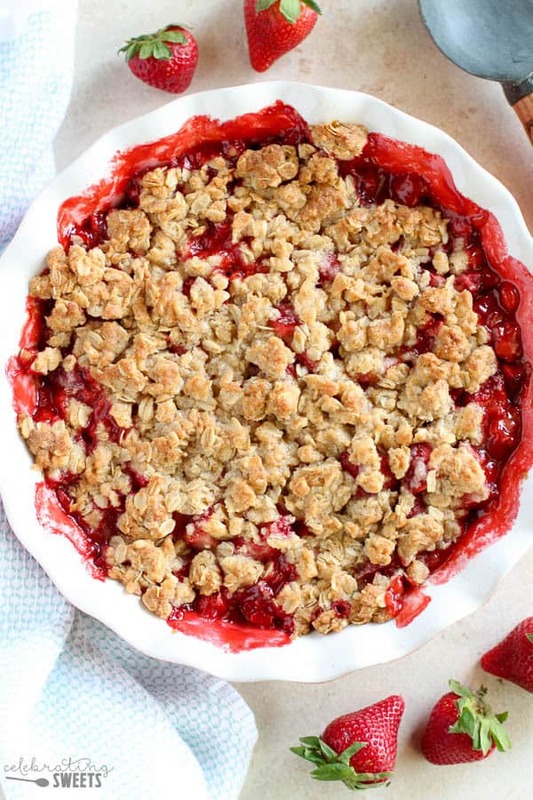 I put those strawberries to good use with things like Strawberry Sangria, Strawberry Pie, Warm Strawberry Crumb Cake, and this super easy Strawberry Crisp. I’m in strawberry heaven over here! 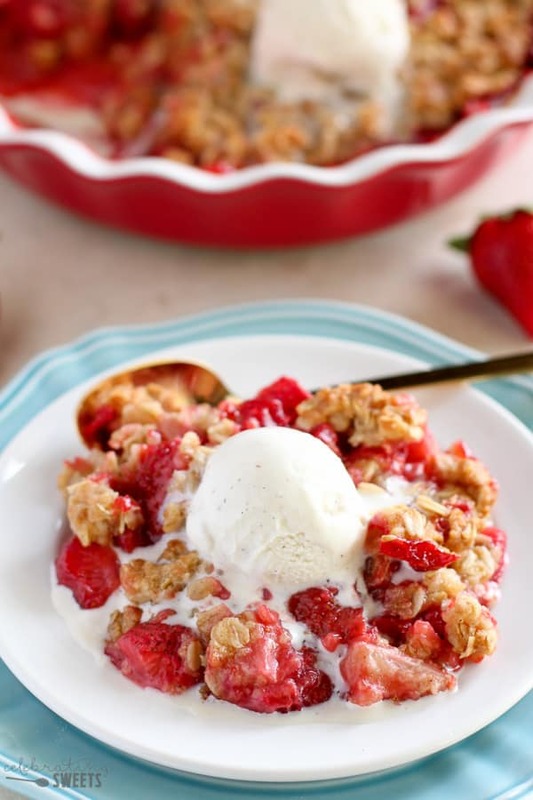 You might also like my Strawberry RHUBARB Crisp! This is the easiest fruit crisp ever. We toss the strawberries with sugar, orange juice and flour and place them in a baking dish. Our topping comes together in 2 minutes – oats, flour, sugars, cinnamon and melted butter get mixed up and crumbled over our berries. This beauty goes into the oven and almost immediately makes your house smell amazing! Once those strawberries are syrupy and bubbling, and our topping is light brown, we pull it from the oven. Let this crisp cool off just slightly; you still want it a little warm when you serve it. And speaking of serving, don’t forget the vanilla ice cream. I say that the ice cream is optional in the recipe itself, but, let’s be real, when is ice cream ever “optional”? 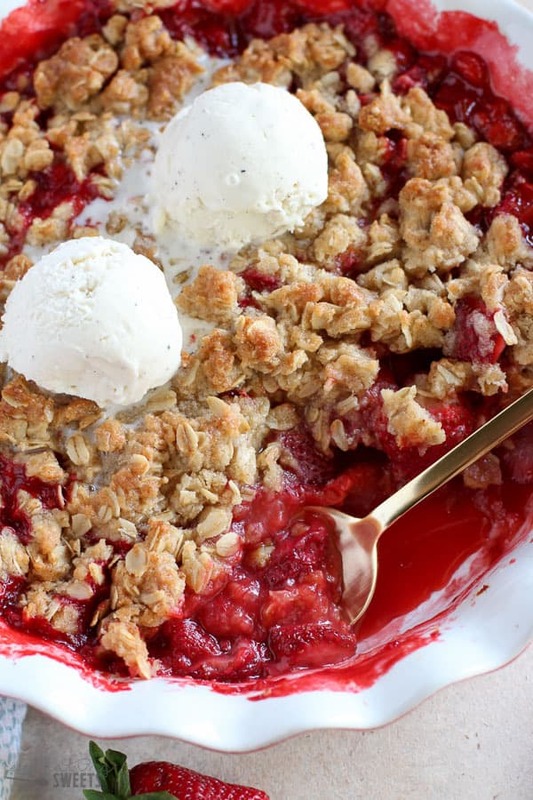 Get the ice cream, make this Strawberry Crisp, and watch it get devoured. If you’ve never made a fruit crisp before this is the recipe to try. Those canned fruit fillings have nothing on this Strawberry Crisp filled with ripe, fresh fruit. 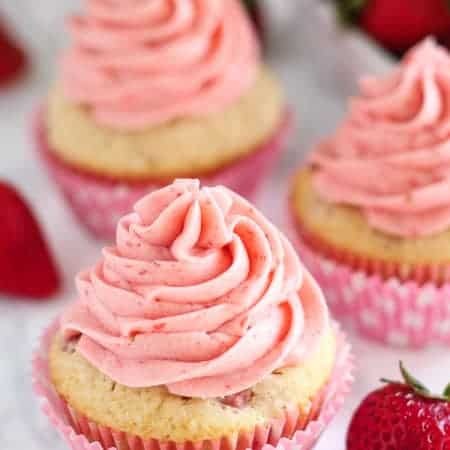 You could even swap out some of the strawberries with another berry (raspberries would be amazing). I hope you give this Strawberry Crisp a try – it’s filled with sweet and fresh flavors in every bite! 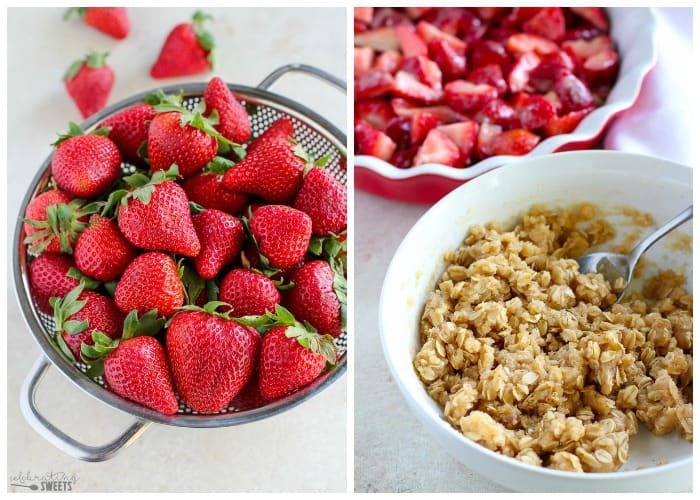 Sweet and juicy strawberries topped with a buttery brown sugar oat crumble. This delicious fruit crisp comes together in minutes and it is sure to be a crowd pleaser. Preheat oven to 350°F. Grease a 9 1/2 inch deep dish pie plate or similar sized baking dish. Set aside. In a large bowl, combine all filling ingredients. Stir gently until well combined. Dump into prepared baking dish. In a large bowl, combine oats, flour, sugars, salt and cinnamon. Add melted butter and stir until well combined. Sprinkle the topping over the strawberries (pressing some of it together with your fingers to form clumps). Bake for 30-40 minutes until the fruit is bubbling and juicy and the topping is light golden brown. 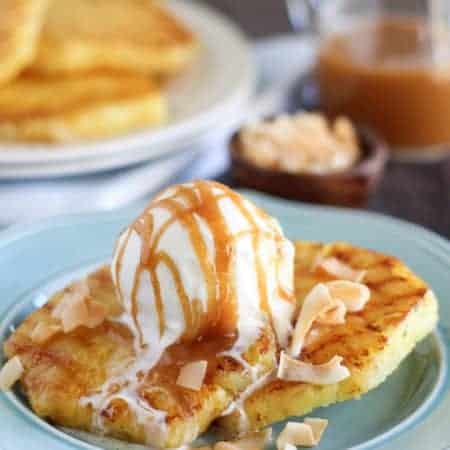 Cool slightly, serve warm with vanilla ice cream. This post originally appeared on Julie’s Eats and Treats where I am a regular contributor. Do you think this would work in a homemade or unbaked deep dish pie crust? Hhhhmmm, not sure on that one. My main concern would be the moisture from the berries making the crust wet. 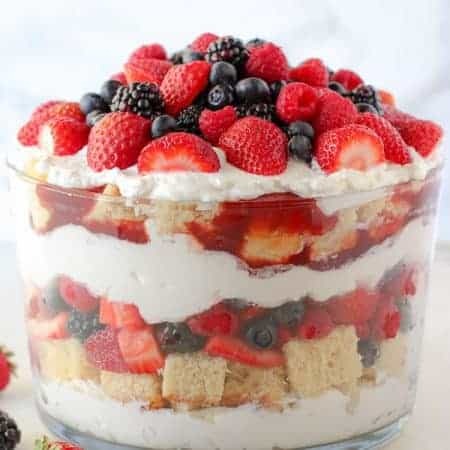 If you want to try it, I would suggest partially baking the crust (maybe 15 minutes or so) before adding the berries and topping. I also recommend adding an extra 1-2 tablespoons flour into the berries to firm up the filling a bit more. Best of luck! Enjoy!